Bradshaw had arguably the most difficult task of any player in Kansas entering this season. He had to replace Tucker Horak as Rossville’s quarterback. 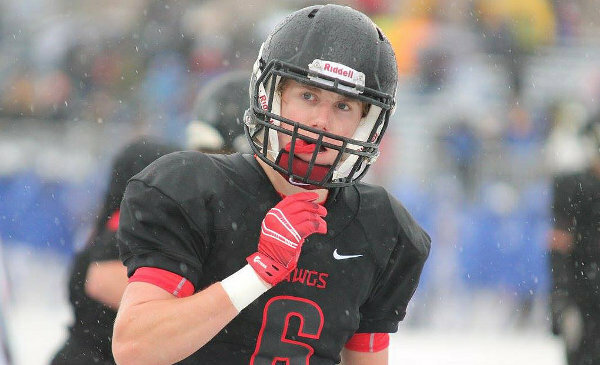 Horak’s outstanding career ended with 12,454 yards of total offense, 178 touchdowns, two consecutive 3A state titles, and a 28-game winning streak. The Bulldawgs have extended that win streak to 31 games and Bradshaw has been capable despite the size of the shoes he’s had to fill. Through three games, Bradshaw has completed 72 percent of his passes for 421 yards and six touchdowns. Like Horak, Bradshaw has done most of his damage on the ground where he has amassed 618 rushing yards and eight touchdowns in three games. Rossville hosts Wabaunsee (1-2) this week before the War on 24 against rival Silver Lake in Week 5. McPherson is one of the fastest backs in Kansas featuring sub 11-second 100 meter dash speed. He racked up 368 yards rushing and five touchdowns last week against Osawatomie, and has nearly 600 yards rushing on the season. Expect him to get the ball a lot against nearby rival Parsons on Friday. The number one question for the Abilene Cowboys entering the season was how to replace dual-threat quarterback Harley Hazlett. Senior Ryan Wilson has filled in nicely for Hazlett, and led the Cowboys to a 3-0 start. Perhaps more impressive has been the Cowboy defense that has allowed 19 total points in wins over Marysville and Andover Central in the past two weeks. The Cowboy defense goes through senior linebacker Parker O'Neal who will be counted on to lead the team in tackles against rival Chapman on Friday. The Cowboys and Irish matchup is the longest running rivalry game west of the Mississippi. The Lancers will look to rebound from a 26-20 loss to Missouri-power Rockhurst in a game in which Shawnee Mission East turned the ball over six times. Shawnee Mission East is led by a strong group up front that has paved the way for 439 rushing yards and 100 passing yards per game this season. The Lancer offensive line includes center Justin Finnigan (6-2, 252, Jr), guards Zac Medley (6-3, 271, Sr) and Charlie Kephart (6-2, 253, Sr), and tackles Stephen Shipley (5-8, 218, Sr) and Parker Shirling (5-10, 208, Sr). Shawnee Mission East will play at Olathe North on Friday. The Eagles ended the Lancers season last fall with a 44-30 win in the Class 6A state quarterfinals, but Shawnee Mission East has won three of the last four in the series by a combined 12 points. Cole Strickler has led Pike Valley (3-0) in tackles entering a key Week 4 game at Northern Plains League foe Osborne. Strickler has 23 tackles, including 16 solo. He has six more solo stops than any other Panther. As well, Strickler has notched one of the Panthers' two safeties. Pike Valley has permitted 11.3 points per contest after allowing 21.5 a game last season. Despite losses in each of the past two weeks, the Grizzlies have one of the most explosive offenses in the state. With a balanced attack of 878 yards passing and 845 yards rushing, the Northwest offensive line can create time and holes for its offensive playmakers. The Grizzlies average 574.3 yards and 47 points per game. Look out for a big offensive performance against winless Wichita West.